In the literature on e-government, the focus is predominantly on the organization of the front office and on the interaction among governmental agencies and citizens (Chadwick & May, 2003; Edmiston, 2003; Tat-Kei Ho, 2002). However, in order for e-government initiatives to be successful, back-office streamlining also has to be taken care of (Bekkers & Homburg, 2005; Homburg, 2005a). In a sense, back-office operations are the backbone of any form of e-government, and they may require information exchange and knowledge sharing among various units, departments, or organizations. The e-government phenomenon occasionally has paved the way for stirring rhetoric of technological and institutional change. For example, Wimmer, Traunmüller, and Lenk (2001) predict that “organizational boundaries will fade and give way to innovative organizational design. In this way, cooperation between administrative agencies will span wide: over distances, across organizational boundaries and even across hierarchical echelons” (p. 1). Actual e-government applications, however, show that the practice of e-government may not be as attractive as some of its benevolent proponents might claim. Back offices can be regarded as networks of organizations in which goals necessarily do not overlap and in which interests may collide. In practice, in these networks, information is the primary medium of value and exchange (Davenport, Eccles, & Prusak, 1992), and relatively uncontrolled sharing of such a powerful resource threatens information monopolies and may provide those organizations who receive information with significant power gains (Bekkers, 1998; Homburg, 1999, 2001; Homburg & Bekkers, 2002; Markus, 1983). Consequently, existing dependencies in organizational networks might be affected, and it can be expected that the exchange of information in back offices invokes a complex mixture of cooperation and conflict (Cunningham & Tynan, 1993; Homburg, 1999, 2001; Homburg & Bekkers, 2002; Knights & Murray, 1992; Kumar & van Dissel, 1996). In this article, I address the following research question: What does the nature and dynamics of interorganizational relations mean for the development and implementation of e-government information systems, and what methods and strategies are used to design and implement these systems? The focus in the analysis is on the interorganizational relations that are mobilized through the integration of various back-office systems (Bekkers & Homburg, 2005; Homburg & Bekkers, 2002). 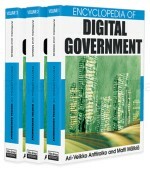 In the remainder of this article, I analyze existing e-government initiatives and, more specifically, information relations among various back offices, using a political economy view on information exchange (Homburg, 1999), and I explore methods and strategies of ICT process management in policy networks (de Bruijn, ten Heuvelhof, & In ’t Veld, 2002).